Our friendly staff will make you feel comfortable. Dental implants are the best option for replacing missing teeth. They are backed by nearly five decades of clinical research and have an average success rate of 95%. Conservatively, Dr. Jeffrey Lee has at least a 98% success rate when it comes to dental implant placement. Dr. Lee has been in practice since 1993. He is a highly-skilled Oral and Maxillofacial Surgeon and a specialist in dental implants and related procedures. He is also a medical doctor with specialist training in cosmetic surgery, which gives him additional experience and expertise in human anatomy and surgical techniques. Dr. Lee is board certified by the prestigious American Board of Oral and Maxillofacial Surgery (ABOMS). Their certification is achieved by surgeons like Dr. Lee who pass rigorous examination to ensure that the highest standards are met. After a thorough oral examination and review of your health, Dr. Lee will get the detailed information needed to create a full treatment plan. You will receive digital X-rays and a CT scan using our advanced Cone Beam 3D imaging system. 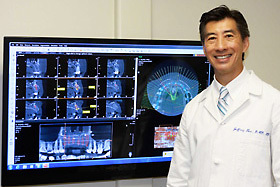 The CT scan gives Dr. Lee a 360º view of your teeth, jaw and skull. He can pinpoint the exact position of your teeth, jaws, gums, sinuses and nerves with this special 3D software. Dr. Lee closely examines all of the gathered information about your jawbone and its anatomy as provided by the imaging studies and diagnostic tests. With this data he creates your ideal treatment plan, giving other potential options as well. This includes giving the advantages and disadvantages of each option. Dr. Lee will explain in detail all your options and together you will decide which treatment plan best fits your personal circumstances. Technological advancements over the last 50 years have made it possible for knowledgeable specialists like Dr. Lee to change what was once a lengthy procedure into a relatively fast and simple one. Extensive pre-planning is done so that everything comes out just as expected. Dr. Lee preplans the implant size, shape and placement using Cone Beam 3D images and study models made from impressions of your teeth and bite. With the 3D images he can measure the relative positions of the teeth, bone depth, nerve position and sinus position. In this way he can plan the perfect length and diameter of the implant, as well as the proper position and angle in which to place it. With more complicated cases Dr. Lee uses the data from the 3D images to create a surgical guide that enables him to very accurately angle the implant into the jaw bone. Because of this detailed preparation, the amount of cutting and drilling required is minimized. Sometimes circumstances dictate the necessity for additional procedures to ensure the successful placement of the dental implant. The following procedures can be considered part of bone reconstruction, in which Dr. Lee rehabilitates the jawbone to an ideal state. In some cases more extensive bone reconstruction is needed, such as after an accident or tumor surgery on the jaw. When there is insufficient bone to place the dental implant, bone grafting is needed so that the implant can be placed successfully. Dr. Lee evaluates various factors to ensure that your bone augmentation procedure will be a complete success. 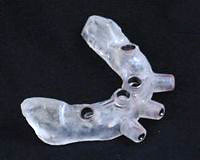 In some patients the sinus may be in a position too close to the desired implant location. This can be due to excessive bone loss in the upper jaw or simply the natural position of the sinus. In a Sinus Lift procedure, Dr. Lee elevates the sinus membrane and then places bone graft material to improve the bone formation for placement of the dental implants. Dental implant placement surgery usually takes around 45 minutes for a single dental implant and up to several hours for multiple dental implants. Before starting your dental implant placement, Dr. Lee makes sure that you understand the procedure. He stays in good communication with you throughout the procedure, listening and acting on any concerns you have. If indicated, Dr. Lee will prescribe antibiotics prior to surgery. Dr. Lee also provides general anesthesia or IV sedation. He will monitor you closely and make sure that you are completely recovered before leaving the office. In most cases you can resume your normal activities within 24 to 36 hours. Dr. Lee and his staff will call to ensure you are doing well and that you are scheduled for your follow-up visits.